St. Vincent's latest self-titled album is a glaring and unapologetic examination of the modern psyche that is executed with technical virtuosity, creative vision, poetic candor, and light-hearted fun. Annie Clark, the human being behind the mad-scientist that is now St. Vincent, has been a well-known and well-loved member of the indie music scene for all of the aforementioned reasons, but her self-titled, fourth record is dramatically different from the bookish artsy meditations of previous albums Actor and Strange Mercy. She ditched her cute brown locks for a high art electrified white quaff, but her new record isn't a make-over it's a coming out party. The brassy beats and high velocity funk of the new record's preview tracks,"Digital Witness" and "Birth in Reverse", prepared fans for a very different St. Vincent. Both songs are wildly funked up rock pop infusions virtually absent of the melancholia that permeated Clark's earlier work. The newly central brassy funk in both tracks seemed to point directly to the influence of David Byrne —the two collaborated in 2012 resulting in the horn heavy record and tour Love This Giant —and it does, just not in the way you might think. The brass behind Love This Giant was actually Clark's idea, the inspirational high from Byrne that allegedly had her writing this new record within 24 hours of wrapping their tour was much simpler: Don't be afraid to be yourself. If you're a quirky weirdo, then lean into it. The record isn't a new St. Vincent, it's a whole St. Vincent, and it's wonderful. The sound undulates through bouncy, bumped-up tracks, like "Rattlesnake" and "Digital Witness", and somber Strange Mercy-inspired confessionals like "Prince Johnny" and "I Prefer Your Love". "Huey Newtown" begins as a contemplative synth march and bends into a grunge stomp. She accesses her Karen O sounding scratch vocals sing-screaming the lyrics, "Entombed in the shrine of zeroes and ones / You know, you know / With fatherless features, you motherless creatures you know / In perpetual night oh it's terribly frightening." Clearly her lyricism retains its artfully elegiac composition. "We'll be heroes on every bar stool / Seeing double beats not seeing one of you," is another example from "Severed Crossed Fingers", the album's beautifully soulful closing track that sounds more like The Band than the Talking Heads. St. Vincent's St. Vincent falls short of nothing. The record has all the satisfaction of a good live set: An utterly kinetic dance party rolled with moments of lighter-waving sobriety, left with an overwhelming feeling of rebirth. This re-incarnation of St. Vincent seems poised to be the answer to mainstream pop. She has the high-art, high-fashion style of an icon with widely accessible musical integrity and most importantly, the uncompromising intelligence to back it all up. 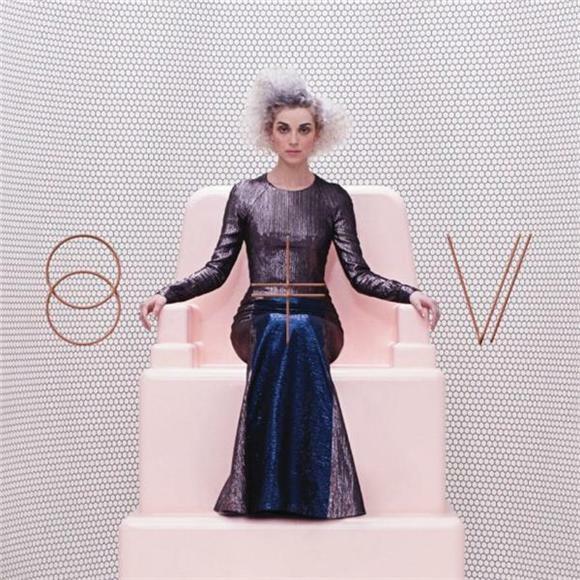 St. Vincent is out now with Republic Records. Watch Chino Moya's abstract concept of the modern isolation epidemic in the official video for "Digital Witness".